Discussion in 'Auto News' started by GTPNewsWire, Aug 30, 2017. This article was published by Andrew Evans (@Famine) on August 30th, 2017 in the Automotive News category. Danoff and marcvic like this. Love the front end and the interior, but there is a bit too much Dodge Durango/Toyota Highlander/Jeep Cherokee in the rear end. I know there is only so much you can do with and SUV, but with the old design, it at least stood out from the pack. Better looking that the old one. How do they distinguish this from the Macan though? It seems so similar. No, no, no, no. Ugly Porsche. Me not fan. No sir indeed not sir. I was thinking Ford Edge. I've said it before, and I'll say it again: thank you, car manufacturers, for bringing back the full-width taillight. The recent Porsche ones remind me of the final Saab 9-5's, so I'm a fan. You sure that's the all-new Cayenne and not just a Macan XL? Yeah, the rear end to me reminds me of the current Ford Edge, but it still seems to match the current rear end styling that Porsche is going with. The tailights make me think of the current Panamera and 911. Is that a 4 wheeled Shark vacuum cleaner? It's cool, but does it need a gear stick? From the front, it doesn't look drastically different from the old one. But the taillights look like they were curbed from a CX-9. But the taillights look like they were curbed from a CX-9. The taillights are pretty much the same to those of the Porsche Panamera Sport Turismo Concept revealed back in 2012. 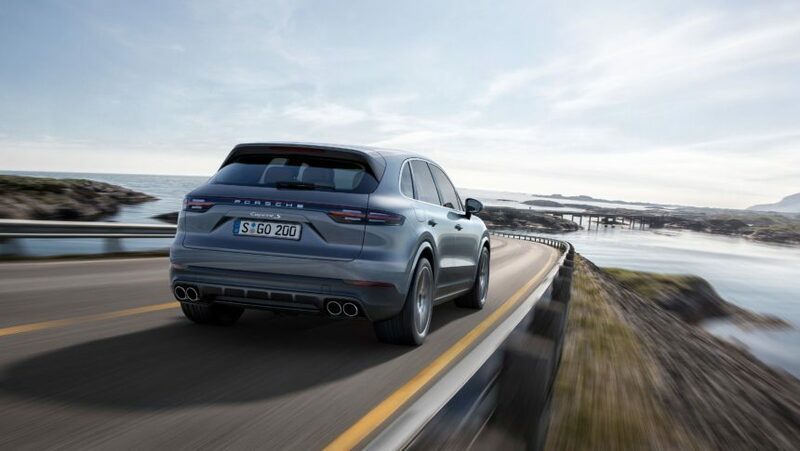 It's almost like Porsche copied the rear end of the Lincoln MKX and pasted it onto the new Cayenne. Looks OK, but drives brilliantly no doubt. BIL has a late 2016 V8S diesel on air. It's a fabulous thing. Fast, reasonably economical (c.30mpg), handles and rides well, has a brilliant interior, loads of space & kit and is very well screwed together. I'd have one in a heartbeat. The Porsche definetly wears it better. GranTurismo guy and GranTurismo916 like this. Although if there is one manufacturer which has the competency to produce the most sporty SUV Coupe without an overly steep price tag, it has got to be Porsche. The slightly sloped rear is what qualifies it as a "Coupe" Also the rear door windows are dodgy as all hell on that thing. You can see quite clearly on the rear 3/4 view photo that it will have a much more classic 911-style rear side window. This mule has a mock standard Cayenne rear side window in tape. The angle of that rear window is barely any shallower than the standard one though. It's hardly the difference you get between the X5 and X6. I have no doubt the guys over at Porsche know far more about automotive aero than I do, but I do question the usefulness of two wings on a car of this size. Mercedes reveals the third generation Cayenne.